Phase II by Hochschule München , CoCoon-Studio realized in 4,5 weeks in February-March 2018. 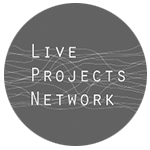 Phase I and research: Center for Public Interest Design, Portland State University and Tokyo University (realized inSeptember 2017). 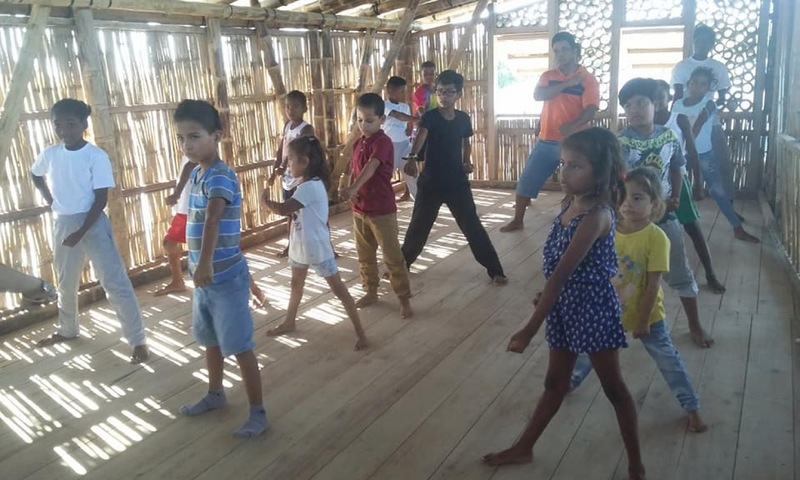 The village of Chamanga at the coast of Ecuador was destroyed to 80% by an earthquake in Spring 2016. The reconstruction process is ongoing but slow. It unveils social, cultural and economic weaknesses that existed before and are now very present. Specially the children and youth suffer under the bad economic, hygienic and social conditions. 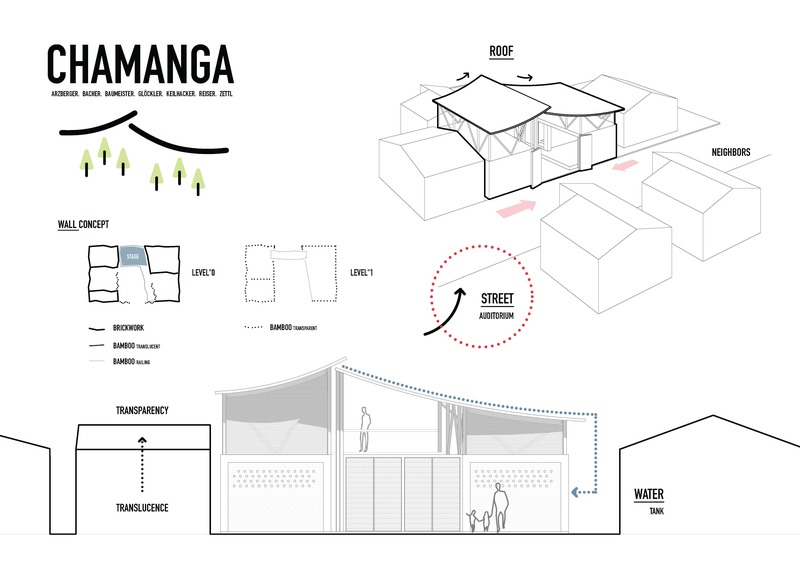 The effort of this studio is, to support the citizen of Chamanga in some small but useful interventions. Amongst many other problems, there is an urgent need for opportunities and space for children and youth to spend their time meaningful. Drugs are infiltrating and start to damage the social tissue. 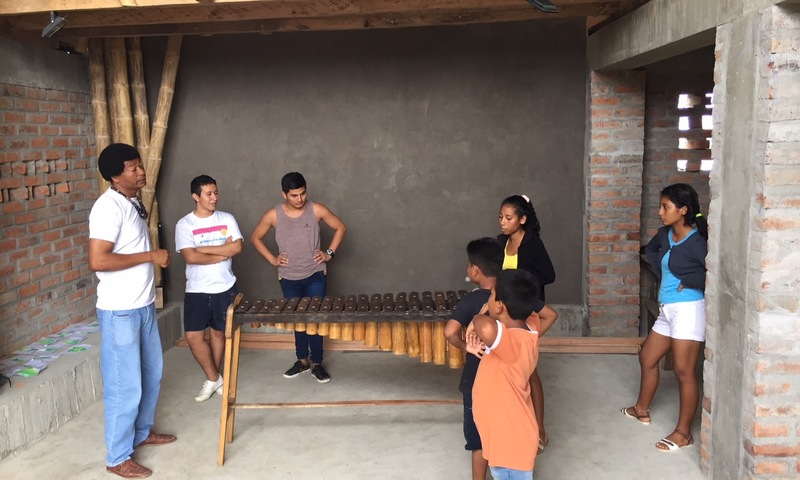 The task of this DesignBuild Studio is to develop a cultural centre in collaboration with the NGO “Opcion Más”, working for several years in Chamanga, teaching and recording music, practicing and performing art. Due to the disctruction of the earthquake they lost their rented rooms. A building plot was bought by the organisation. 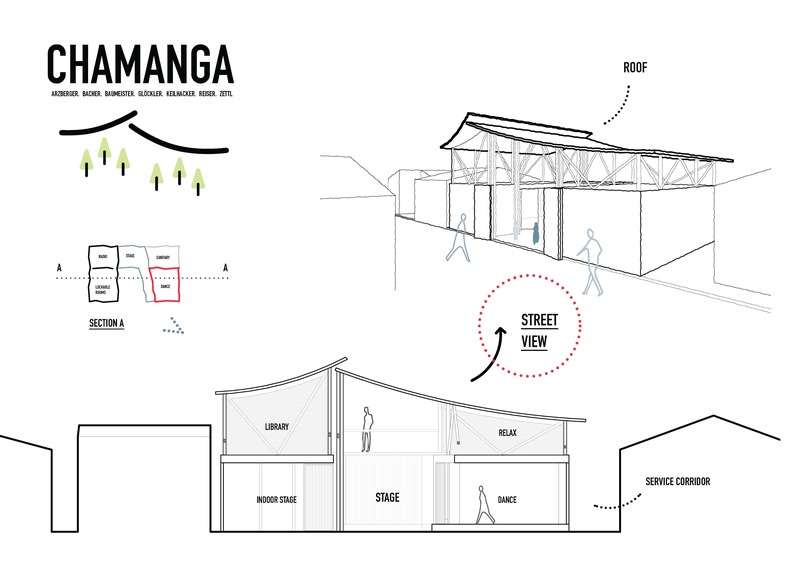 An international team of Universities supporting the village of Chamanga in this crisis started to redesign the centre in 2017. 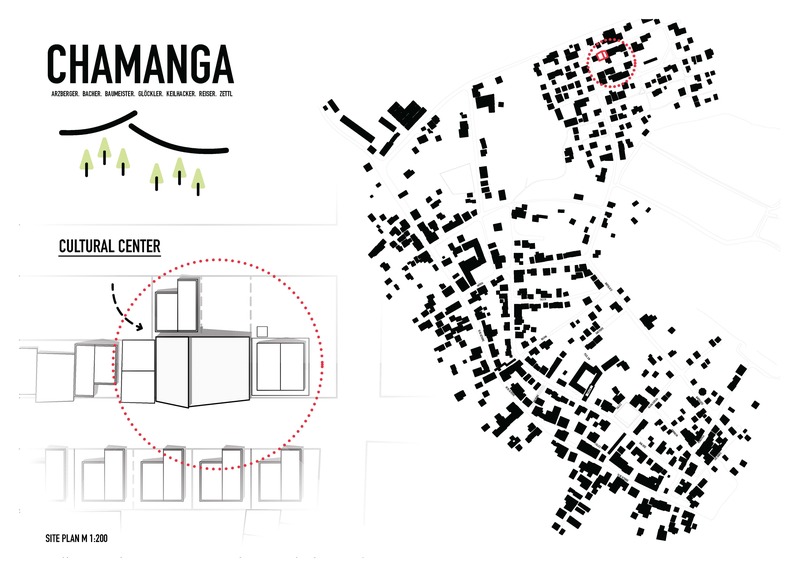 The first phase was designed by the Centre for Public Interest Design from the Portland State University designed together with collegues from the Tokyo University. it was realized in September 2017. (the brick-concrete volume on the right, ca. 50 m2). The db project of HM joined in in October and designed and realized the second phase: A mirrored brick building and a second story of bamboo, ca.180 m2. The center offers multi-usable and modifiable spaces for theater, music, dance, sports and arts. A stage at the end of the entrence hall allowes performances and cinema presentations. The other spaces offer differnt characteristics and can be conected or separated from the main hall. 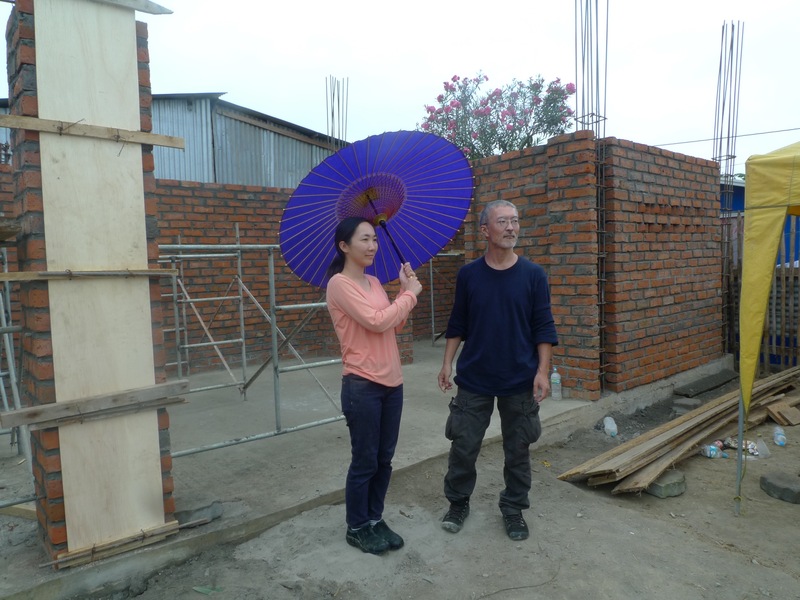 A compost toilet and a rain water colection is completing the compound. In a two step-jury process, the best design was selected out of 5 alternatives. The architects and engineers had to struggle with the small dimensioned ground, a short budget and a tight timeframe (4,5 weeks for buidling). The design decision was, to mirror the existing first building to the other side and create an entrene hall in the middle. A second story of bamboo was added to the single story concrete frame building with brick mansonry infill. The most important issue was the earchquake appropriateness of the building. The engineers rimplemented a bamboo lab-testing series to develop a good behaviour of joints. Infills of concrete reinforce the most stressed bamboo- segments. The concrete structure of the first floor building is bearing heavy reinforcements to realize a strenght against earthquake- impacts. 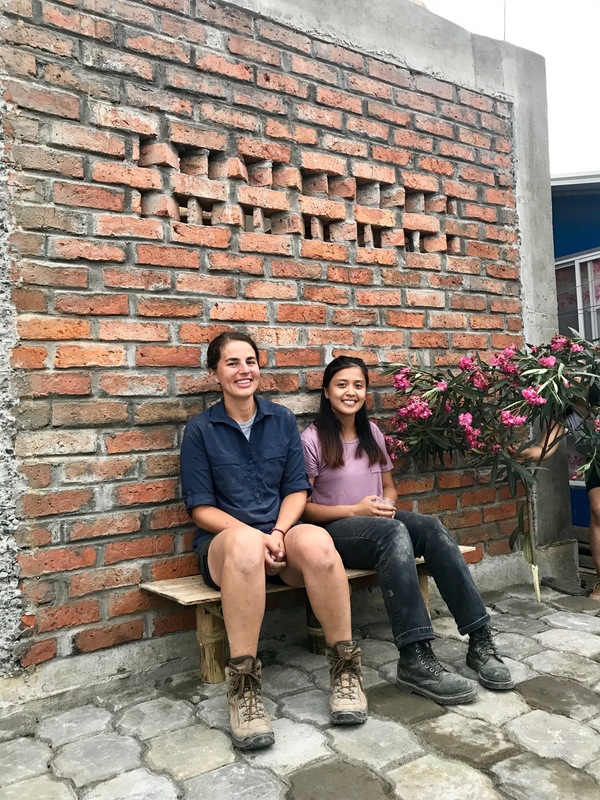 The brick- infill was realized in a second step and is not atached to the concret piles but is counting as well with a rebar-reinforcment in every 5th brick layer. 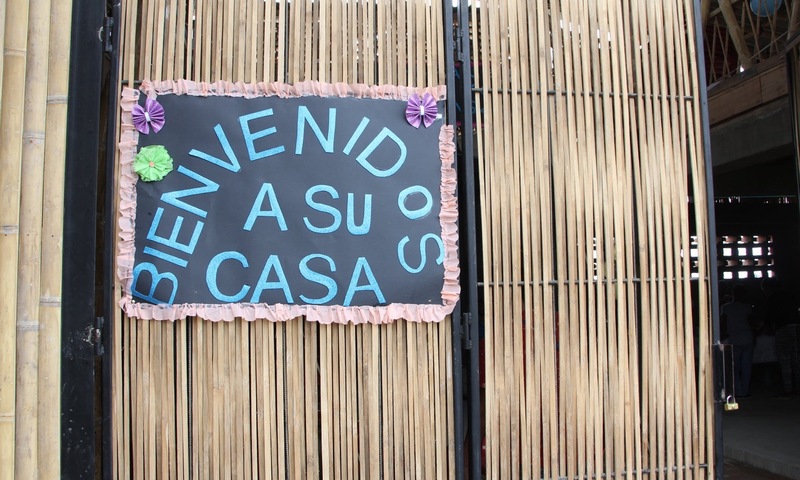 The 8th of March, the Center was inaugurated with a cultural programme and the precence of the German Embassador in Ecuador. 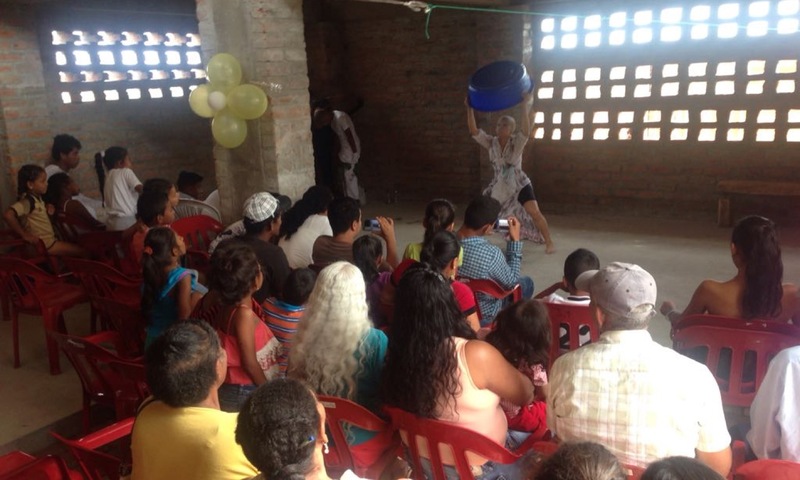 Since then, music classes, tekwondo courses, capacitaion, neighbourhood meetings and other dommunity related activities found space in the Culrural Center Camanga. 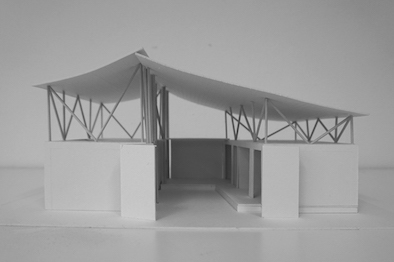 The new cultural center is particularly striking because of it second skew structural shell. With its inviting gesture it surrounds the free space and draws all attention to the central main stage. The structure of the initial building is integrated by repeating the reinforced concrete frame. It is then perfectly reflected in its new opposite building. The auditorium provides extra space in case of crowded events, as the frames by the entrance can be extended onto the open street. 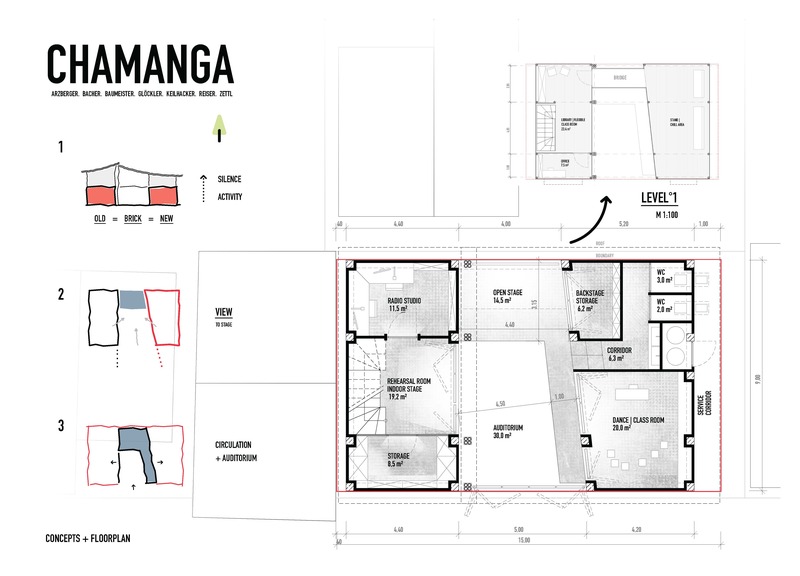 Additionally, a second floor will be added to provide space for a library, meeting point, and radio studio. On the ground floor the radiostudio, a storage room, as well as a flexible room that can be used as a small stage, find their place. The first floor is entirely built from bamboo. 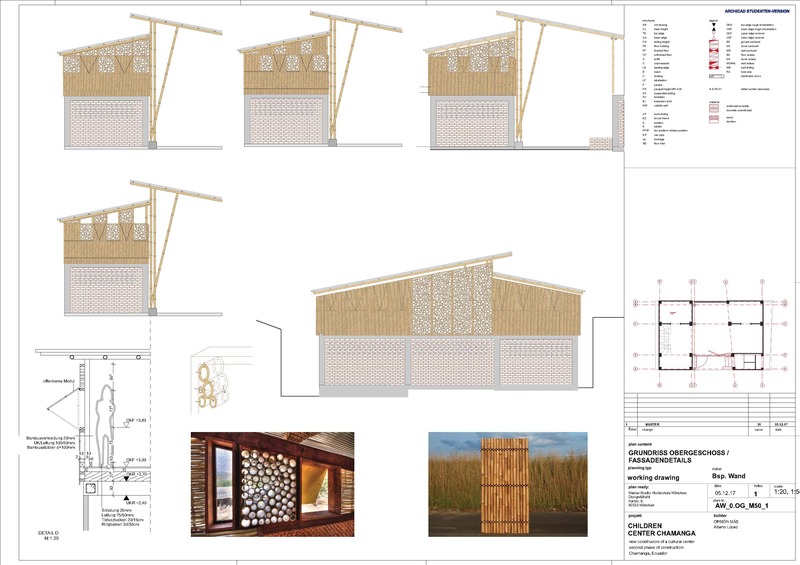 The fassade, as well as the foldable elements within the braided bamboo facade take care of consistent fresh air ventilation. The pent roof faces the yard and leaves a gap to further ventilate. The space between the buildings gives in fact room for the heart piece of the project: Its auditorium and stage. The stage is 30cm high and passes with its width of 100 cm along the dance room, to accommodate seats as well. This elevation enforces this zone to be a meeting point. The space on top of the new building is connected with a small bridge which can be used for install technics for the stage. The second floor of the new building is a low storay to use as a stand. Especially for children it is a nice separated playground. The materials of brick, concrete and traditional bamboo create a pleasant and restful color image. It invites visitors and residents to dance, for music lessons or to just come by and meet nice people. 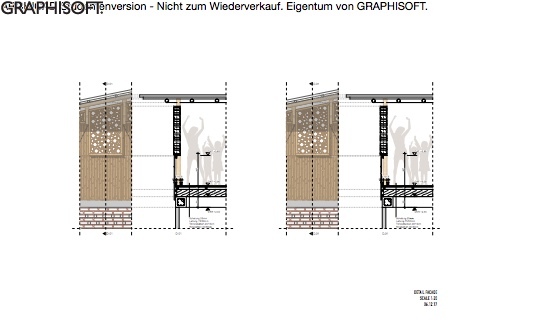 We had to develop a facade that permits the entry of light and air but keeps out the rain in this hot, humid and tropical zone and protects against burglary (without using glas as it will brake easily). 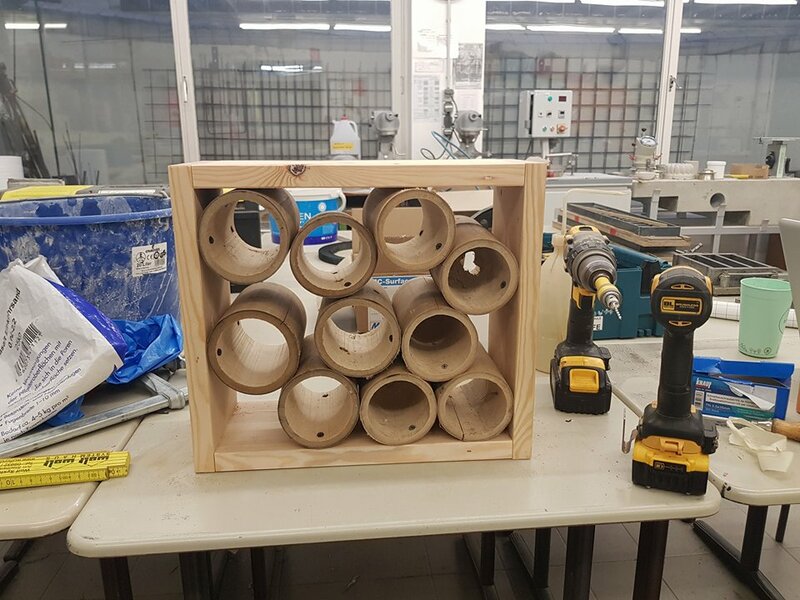 The students found a solution, using 20 cm bamboo-cuts, screwed togehter in a frame, lightly inclinde so that all above mentioned conditions are fulfilled! They tested the feasibility in Germany in a lab and it seems that we can do it (about 50 m2). In September 2017, Students from the PCentre for Public INterest Design under the directipn of Sergiopalleroni budesigne and buid the forts phase of the centre. They have ben supported by Mika Akari and Jun Sato for structural sytstem and Akiko Okabe and students from the Tokyo University. They finished the first set of rooms build in mansonry and concret framework. 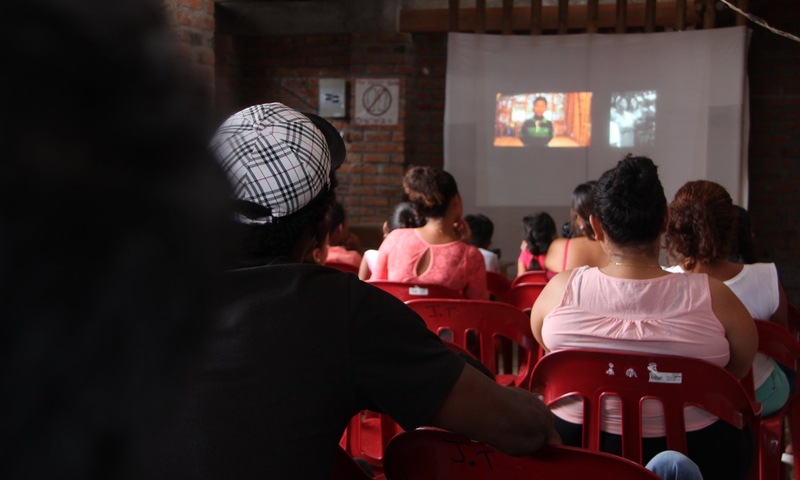 Financial SupportGerman: Sto-Stiftung, Deutsche Botschaft Ecuador, GAD (Decentralized Administrative Government of Chamanga), Hans Sauer Stiftung, Michalke Bauunternehmen Muenchen, Deutsches Ziegelzentrum Sued. e.V. The plot has a dimension of 9 x 15 qm. The constructed and usable coverd space wil be about 120 qm. 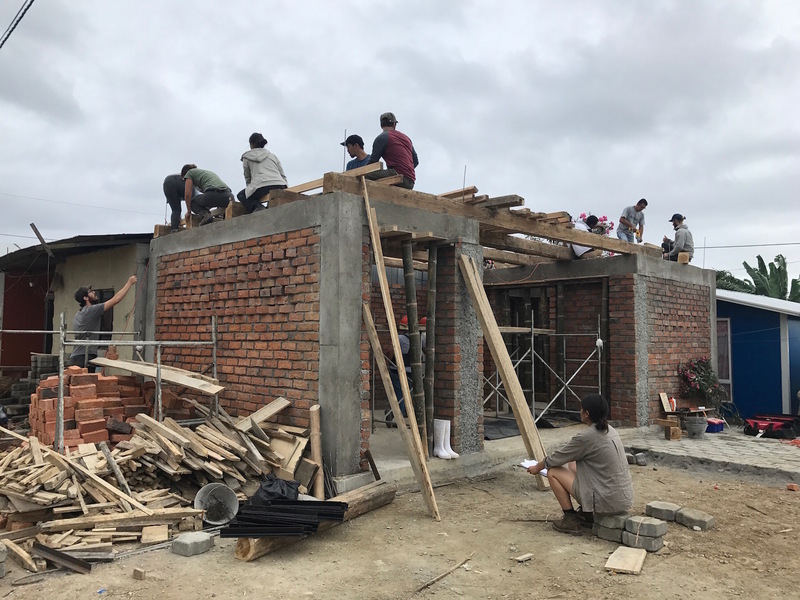 The Construction is devided in a firs floor made out of concrete framework and brick infill, the second floor and roof is constructed out of Bamboo (cana Guadua) and wood. The content is liscensed under the following Creative Commons license. Forgot your password? Request a new password.